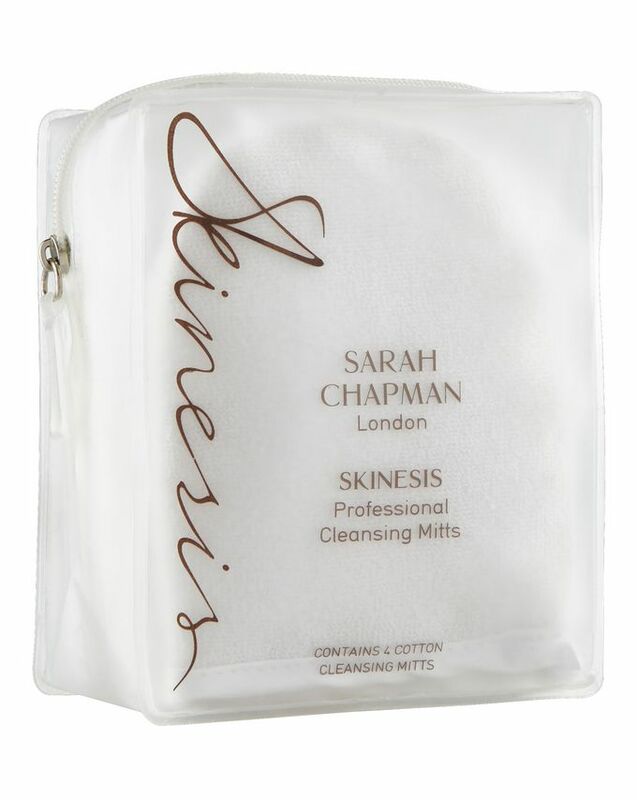 Developed by sought-after facialist to the stars, Sarah Chapman, these clever, dual-sided cleansing mitts deliver the experience of professional cleansing in your own home. A layer of sponge held between two layers of cotton fabric, the four mitts feature one textured side for exfoliation and one gentle, finely weaved side for removing make up delicately. Fitting snuggly onto fingers, these mitts couldn’t be more effortless to use and are certain to make any cleanser (or mask, for that matter) perform at its peak. Casting a shadow over most traditional cleansing cloths, Sarah Chapman’s Professional Cleansing Mitts were developed for her professional, Skinesis facials – which you can now replicate at home. Swiftly sweeping away cleanser, dirt and impurities, the mitts feature a layer of sponge held between dual-effect cotton fabric, with one textured side for exfoliation and one gentle, finely weaved side for removing make up – especially from the delicate eye area. The sponge layer retains heat and moisture for longer than traditional cloths, allowing for a cushioned, comfortable and professional cleanse and, what’s more, the mitts fit snugly onto fingers, making them effortlessly easy to use and effective at removing cleansers (whichever kind you choose) as well as masks. Suitable for all skin types, this set contains four mitts so you can cleanse to your heart's content. Soak mitts in warm water, slot over 4 fingers and use to wipe away cleanser, make-up and grime gently exfoliating. Use the fine side for eye make-up removal. Wash at 30 degrees in the washing machine. Cloth: 100% Cotton. Smooth Cloth: 70% Cotton, 30% Polyester. Sponge Line: Polyethylene. Ribbon: 100% Polyester. Really love them. I normally use a muslin cloth so these are a welcome change to use with other cleansers always feel really clean after using them. Really happy to have more than one so I never run out & great for travel as they come in a reusable plastic bag. Highly recommend. Way to hard for sensitive skin. Design is nice. I have sensitive skin and it works really good, I use them (gently!) everyday. I didn't give 5 stars just because I would like a softer product. Don't use the washing machine to clean them or they'll be way harsher. Great design - a little too harsh on both sides to use daily on my sensitive skin. Four times a week approx. for me, they work beautifully. I also love the durable plastic cover which allows me to take them for travel.